NEW! 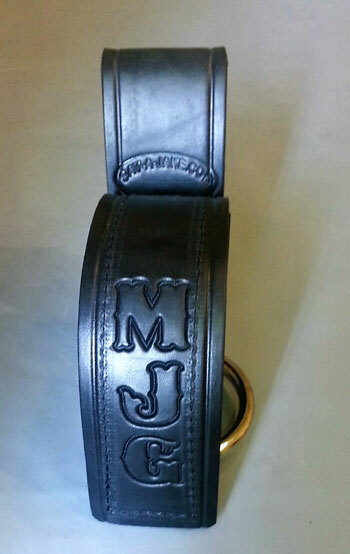 Personalized Leather Axe Holster - embossed with up to 9 letters! Our leather axe and halligan bar holsters are a versatile, durable, simple and easy to use design. 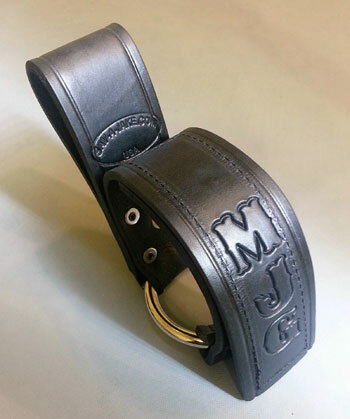 The holster is made with 100% harness quality leather and a nickel plated steel ring. There is a velcro closure to hold the axe securely in place. To attach the holster to your gear - just slide your belt or SCBA waist strap through the leather loop. Then drop your axe handle or halligan bar through the ring, fasten the closure, and you're done. It's that simple! The 2 1/2 inch ring holster will hold all sizes of axes, as small as the truckman's axe, and 6-8 lb. size pick head or flat head axe. The 3 inch ring will hold a halligan bar with a fork that has a 3" outside spread. Firefighter 1.5 inch wide Leather Radio Strap & Holder Set "The Thin Red Line"